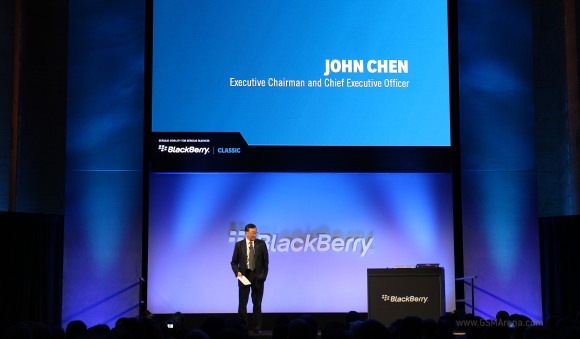 BlackBerry Classic has been teased and leaked numerous times before and the veil surrounding the future of BlackBerry has been finally lifted. The manufacturer is returning to its roots bringing back the classic QWERTY keyboard, the iconic square trackpad and the traditional hardware controls. Mixing new technologies with old traditions BlackBerry Classic is supposed to achieve success with both newcomers and loyal fans. And indeed, things look promising - the Classic is a compact _phone_ with a high-res touchscreen, snappy hardware, a critically-acclaimed design and all the features that once made BlackBerry a best-selling company. And it works with Android apps as well. The smartphone has been available on pre-order in the USA for a while but with all the important details from its specs sheet missing, we are surprised it has been a reported success, as per Blackberry's own account. We got to spend some quality time with the BlackBerry Classic at its launch event in New York today, and we are ready to share our first impressions. Does adding a touchscreen and BlackBerry OS 10 works well with the old-school keyboard, trackpad and control deck? Let's find out. BlackBerry Classic looks a lot like its Bold 9900 sibling, intentionally of course, as the company wants to keep it this time as close as its best-selling phones from the glorious past. The modern upgrades are easily noticeable as well - you get a high-res touchscreen, capable camera department and stylish exterior. The BlackBerry Classic features a 3.5" 720p touchscreen with 294ppi density and Corning Gorilla Glass 3 protection. It runs on a dual-core 1.5GHz Krait processor with 2GB RAM, just like the popular BlackBerry Z10, and offers an 8MP rear cam with a LED flash. The front look as a traditional BlackBerry - there is the beloved four-row QWERTY keyboard with ergonomically-shaped keys, a square display and the brought back to live helpful trackpad. The control deck is here to stay too - you get the familiar call buttons plus the menu and back keys. The _phone_ revolves around a silver metal frame, while the non-removable rear is made out of high-quality plastic with grippy dotted pattern for extra pleasurable handling. Indeed the BlackBerry Classic feels great in hand, as all its predecessor did, compact and comfortable to use for typing or browsing. The 8MP camera lens and the LED flash are highlighted over the back with a long glass plating. The bottom of the phone looks like it is housing a set of stereo speakers, but as it turns out the second grille covers the primary microphone of the device. The SIM and microSD slot are on the left side, both in ejectable beds. The Classic connectivity package includes GSM, 3G and Cat.4 LTE support, dual-band Wi-Fi, Bluetooth 4.0, NFC, GPS and FM radio. The BlackBerry Classic is already available for purchase worldwide via selected carriers and retailers. Pricing in the US is $450, while in Europe it should cost 450. The phone revolves around a silver metal frame, while the non-removable rear is made out of high-quality plastic with grippy dotted pattern for extra pleasurable handling. Indeed the BlackBerry Classic feels great in hand, as all its predecessor did, compact and comfortable to use for typing or browsing.